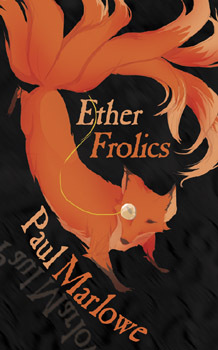 Ether Frolics is Paul Marlowe's third steampunk work. He is also the author of Sporeville and Knights of the Sea. Both of his former books were fabulous reads (you can read my reviews here) and his newest book continues this tradition. The only difference here is that Ether Frolics is a collection of short stories. They do, however, have a common theme and thread through the “Etheric Explorers Club” and its fine leader Rafe Maddox. Ether Frolics is a wonderful mix of steampunk and gaslight. There are gadgets, ghosts, magic and mayhem. The stories cover a time period from the first World War back to the late 1800s. Yes, that's right, the stories begin in a later period and gradually end at the beginning. Each period is part of a separate section with an introduction to each. The transition is smooth and it works quite well. The stories themselves are all quite individual, but they are well tethered together right to the end. As I have been quite busy over the summer months, this book was a blessing as I could enjoy one story at a time. It was so enjoyable, however, that I did make time to read at least two at a time. Within the stories you will find, like in the author's previous books, a great deal of factual history mixed in with the fiction. Although Sporeville and Knights of the Sea were both full of Canadian history (and set in Canada), these stories are based in various places including France, England and the Antarctic. There are still a number of Canadian connections to be found in a number of the tales, including one story set on Sable Island. The new characters Mr. Marlowe has created are quite enjoyable. My favourites were the strong females, especially Brenna and Violet. You will also find that each story contains the author's usual wit and humour even through some very harrowing encounters. At one point after reading one of the stories I stopped and handed the book to my husband. I thought “TheLast Post” was so good that I needed to share it right away. He thought it was very good as well, and has been pestering me to finish the book so he can read it next. Paul Marlowe has once again written a fine story, but this time he has done it nine times over. Even the author's foreword and the introductions to each section are quite entertaining. I highly recommend Ether Frolics. It is such fine storytelling, you will be so entralled your tea will go cold! I am working through this book now - after I pried it out of the Countessa's fingers that is. The stories are excellent and thought provoking. Thanks - it's good to know that you're enjoying it!